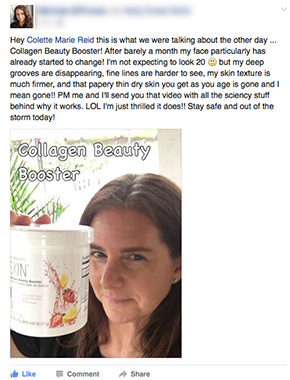 Collagen Beauty Booster Works by Nourishing Your Skin from Within! One of the most overlooked reasons for fine lines, wrinkles, and cellulite, as you age, has to do with collagen. Fact: Collagen comprises about 75% of our skin, and it’s responsible for giving the dermis (thick inner layer of your skin) its' firm structure. The problem is, as you age, usually around age 25-30, the production of collagen in your body starts to diminish resulting in a loss of firmness, elasticity, and the appearance of wrinkles. In fact, it drops around 1% per year if you don’t address the issue - and wrinkle cream alone may not be enough. The good news is... by drinking Collagen Beauty Booster you now have a way to support the production of collagen in your body and help restore your youthful skin! The results have been nothing short of stunning! As a beautiful aging woman looking in the mirror daily, I noticed a line or two, that just weren't so beautiful!! I won't even mention how self-conscious I was about my neck! 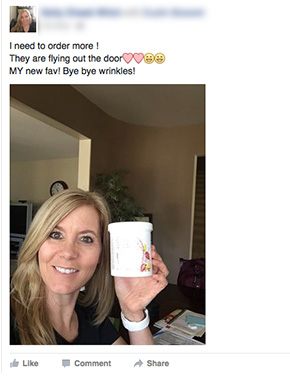 I got started with my Herbalife Collagen Beauty Booster in July 2016, and I was absolutely blown away with my results in just a month or so! I have much more confidence in my appearance. No lines...My neck is great, and I no longer have those deep parentheses around my mouth. I saw a friend the other day who told me she had seen my Beauty Booster posts on Facebook. Then she said, “The posts were amazing, but it’s even better in person! Look at you! 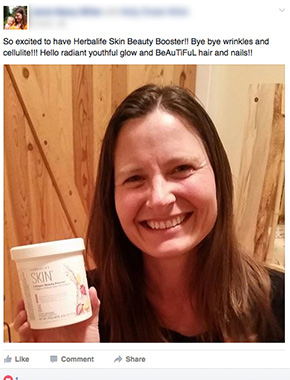 Your skin is glowing!” I’m feeling way more confident about turning 50 in a few weeks! 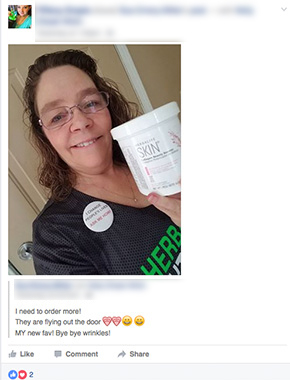 Thank you, Herbalife, for this incredible product! Drink it once a day and see wrinkles and cellulite disappear. Trust me...you don't want to miss out on this incredible product! Those are MY LEGS, and just look at the cellulite vanish! 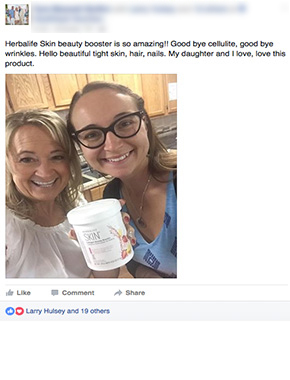 We all need collagen. You definitely see what it does for the skin!! 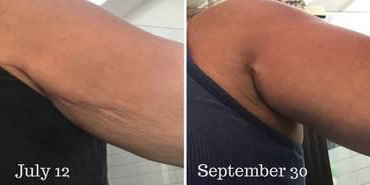 After 7 days and a light arm regimen twice a day, my results speaks for themselves! Most of my life I was fortunate to have good skin. But once in my mid 50's, I started to notice looser, crepey skin on my arms, legs and neck. 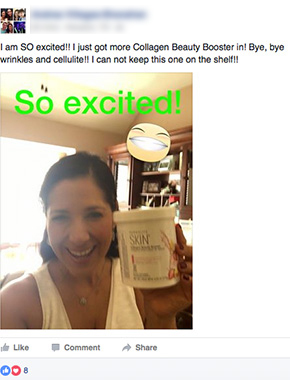 I'm thrilled that one delicious Collagen Beauty Booster drink per day can help that disappear! I love the taste of the product! 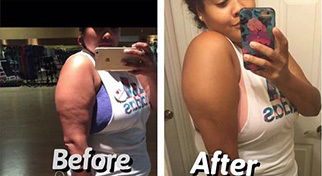 I kept seeing results from other people & wondered if the product really worked. Well, my results speak for themselves! My cellulite has gone down. My hair has also grown so much! I’m shocked! I was skeptical when I first started using the Collagen Beauty Booster, but I really loved the taste so I decided to give it a try! I am amazed at the results! 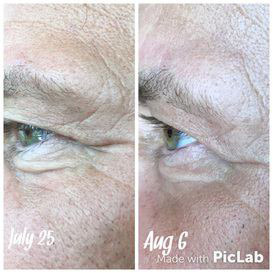 My skin looks and feels smoother, and the fine lines around my eyes are disappearing! I love the product. I love Collagen Beauty Booster! It tastes great, and the results I got were amazing. My favorite thing about it is I don't have to remember to put it on my face. I drink a serving a day and have great results! * Studies show women aged 45 and older can generally expect comparable improvement in appearance of wrinkles in just 4-8 weeks when taken as directed. Enjoy the refreshing strawberry lemonade flavor. 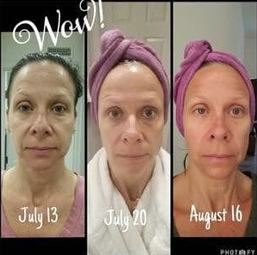 To visibly see your skin transformation, take a before photo of the most wrinkled part of your skin before you start drinking Collagen Beauty Booster, and then another photo 4 weeks later of the same area of skin! *Women aged 45 and older can generally expect comparable improvement in appearance of wrinkles by using the Herbalife® product as directed, administering at least 2.5 g daily of the Verisol® branded ingredient over a period of at least 4 weeks. Based on a study of 110 women, consuming 2.5 g of Verisol® ingredient in neutral composition daily for 4 and 8 weeks. 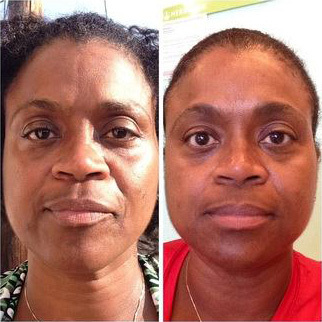 Fill out the form below to get started with a 30 day, risk-free supply of Beauty Booster! What’s your #1 goal with Beauty Booster? Do you use any other skin care products? *Bioactive Collagen Peptides® is a registered trademark of GELITA AG. 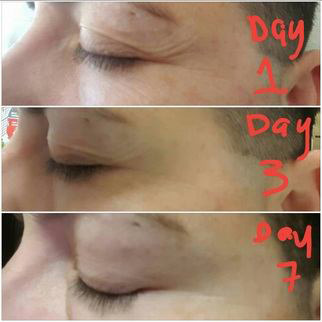 **Clinically tested on subjects, skin roughness measured by visioscan at intervals of 0,7 and 42 days.